Don’t get caught in the blizzard, ride safe! The weather has been crazy over the last few years, and snow has been in Georiga a few times in the last five years. 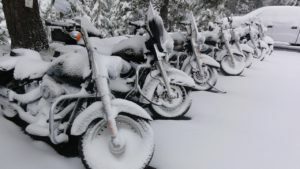 If you’ve never experienced snow before, driving and riding your motorcycle can be terrifying. The ice and snow on the road creates a hazard that any inexperienced driver can lose control on. We have a few tips and tricks from some Northerners that will help you this Winter season. If you don’t want to slip around on the road, the easiest solution is to check the tread on your tires. If your tires are bald or the tread is worn out, this will cause you to slip around and possibly crash. Get your tires replaced. When taking corners or turns on your bike, make sure to take them slow and easy. No sense in rushing through a turn that could cause you to slip on your bike. The best way to have a safe stop is by putting your breaks on earlier than you think you’ll need. Having to roll up to a stop is not as bad as sliding through a stop sign. Lightly applying breaks as you approach your stop will help you be in control of your motorcycle. If you are ever in a situation where you feel uncomfortable, better to be safe than sorry. Slow and steady wins the race, and arriving alive is more valuable than arriving on time. We hope these simple tips help with your winter riding experience (just in case it snows) and remember if you want to sell your old motorcycle we’ll buy it off you!